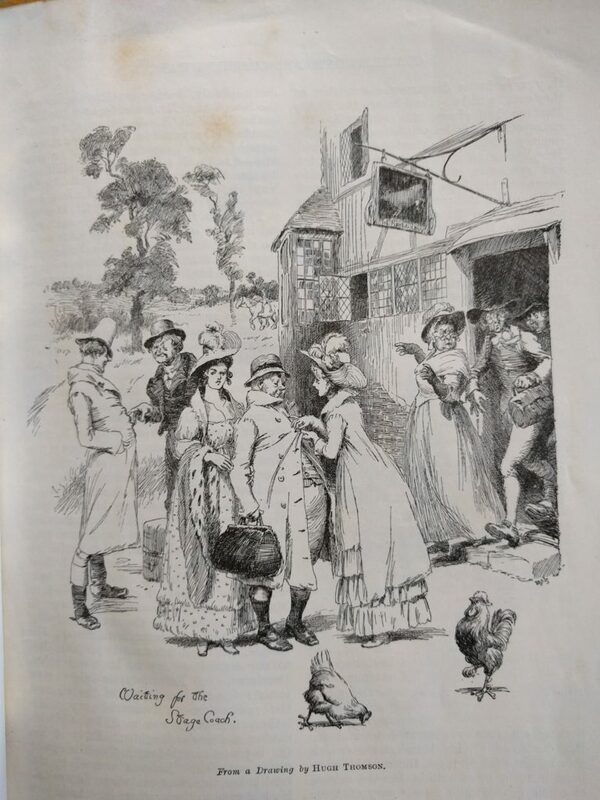 I might have mentioned previously that one of my favourite illustrators for the works of Jane Austen is C. E. Brock (1870-1938). 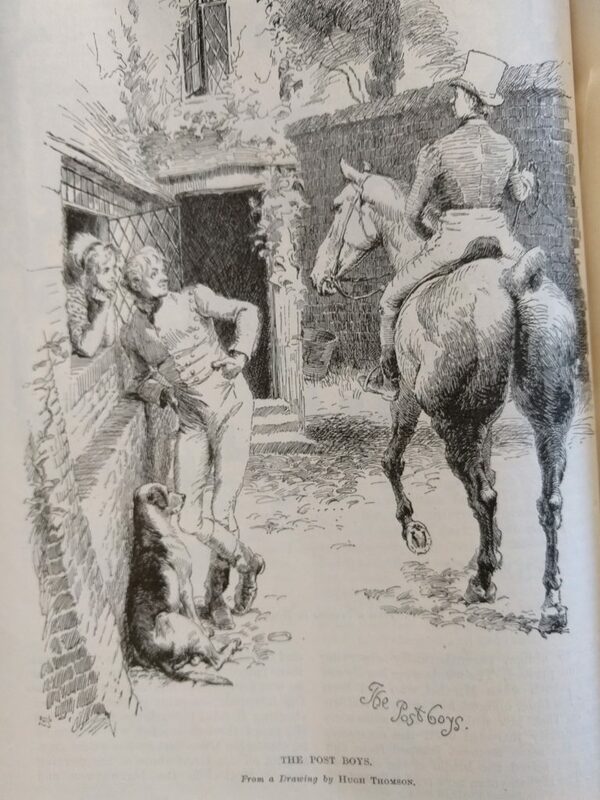 Several weeks ago, during my visit to Bath, I was fortunate to find an edition of Pride and Prejudice illustrated by Brock, and snapped it up. Happily, it did not cost a lot. 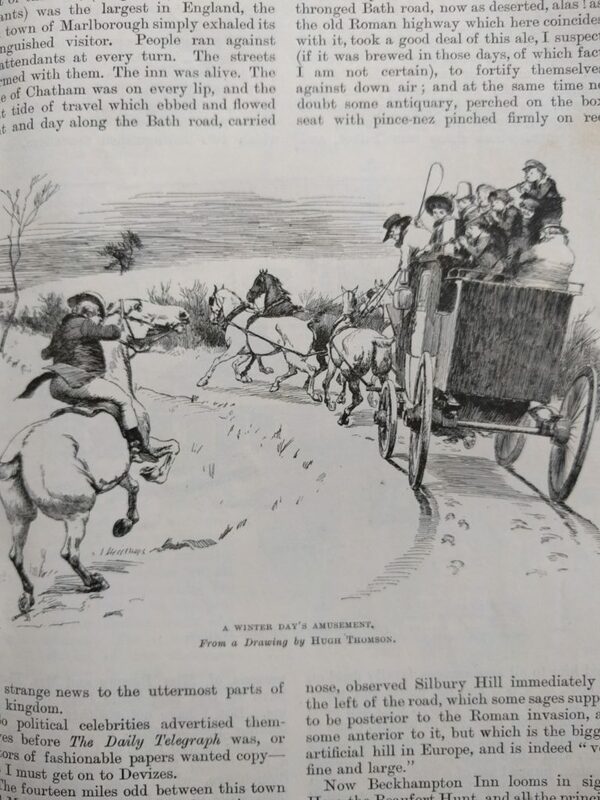 Another illustrator of Austen’s stories, whose work I admire is Hugh Thomson (1860-1920). Born in Ireland, Thomson had no formal training as an artist, and it was only when he started work for the publishing company Marcus Ward and Co, that his talent was discovered. 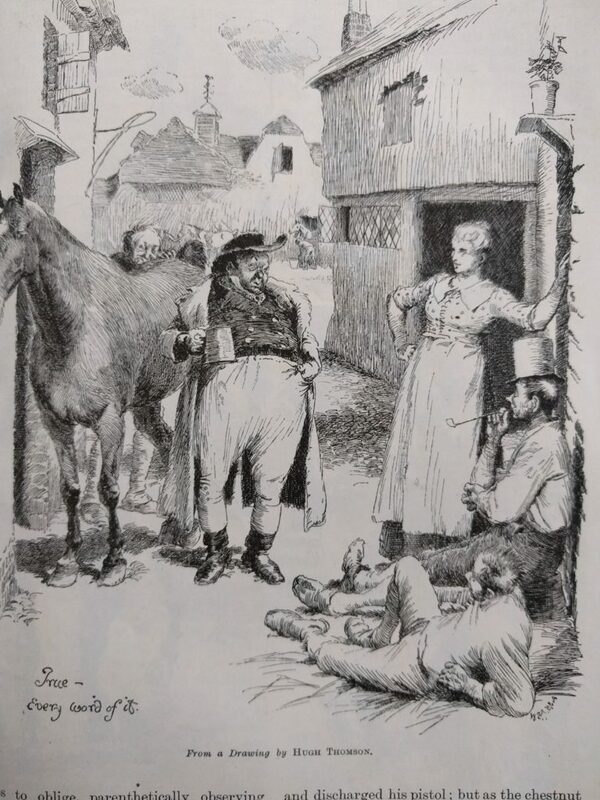 In 1883, he moved with his family to London — by now he had married and had a son — where he became a leading contributor to The English Illustrated Magazine. Now, I’d only been aware of Thomson’s drawings for Austen, so it was with pleasure I discovered another whole aspect of his work. I recently purchased a compilation of articles published as a book entitled Coaching Days and Coaching Ways. 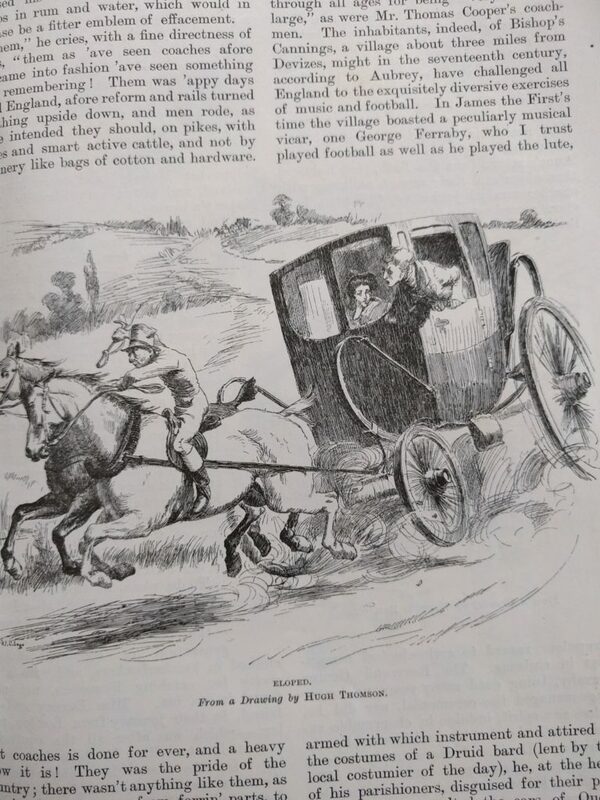 Written by W. Outram Tristram, sometime between 1887-1888, as a series of articles for The English Illustrated Magazine, it wasn’t quite what I was expecting. ‘I shall, that is to say, bind myself neither to time, place, nor consistency of attitude to my subject’. An easy read it is not. 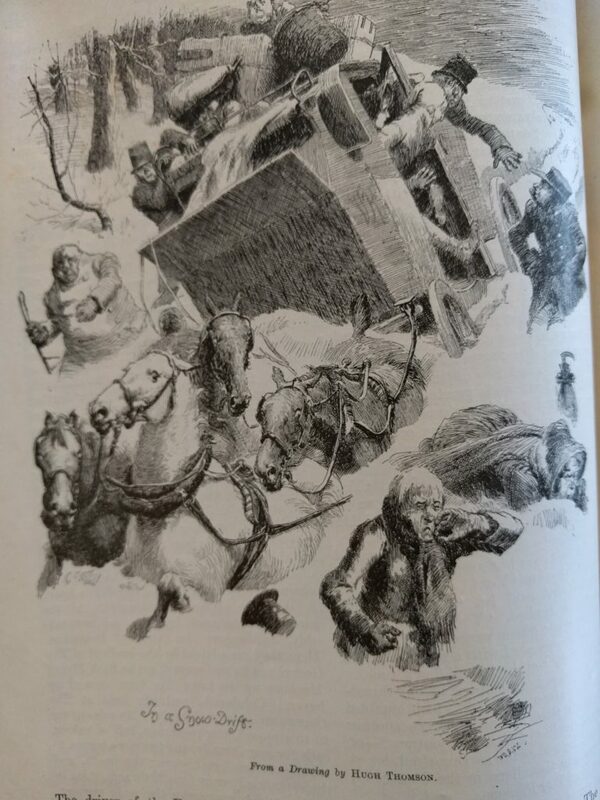 However, the saving grace of this book for me is that it is copiously illustrated with Thomson’s drawings, as well as others by Herbert Railton. Railton’s drawings tend to focus on buildings and places, whilst Thomson’s are very much concerned with lively scenes of people and characters — one can almost construct a story for every image, such is the detail he manages to imbue with a few strokes of pen and ink. As might be expected from the title, coaching scenes abound — departures from inns, waiting for the stagecoach, even an elopement — each picture conveys not only a sense of movement, but the personality of each character portrayed. 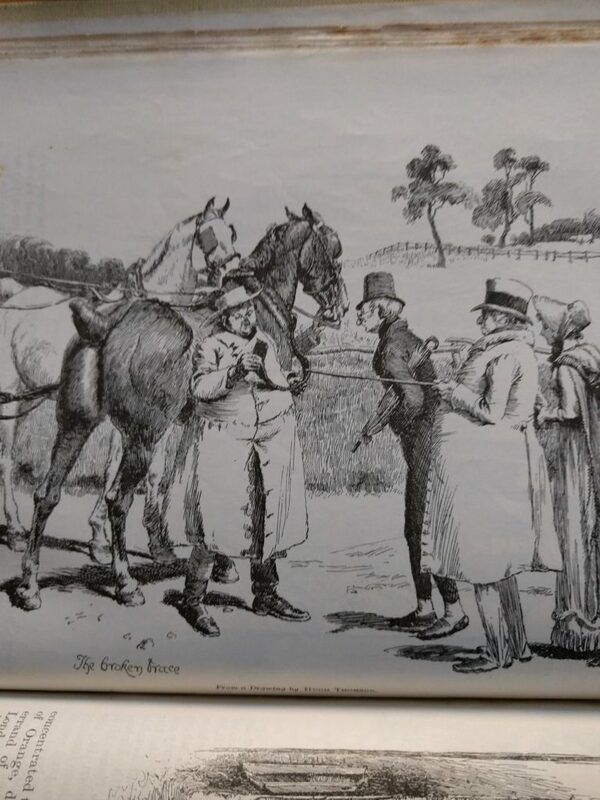 Thomson excelled not only in his character drawings, but also in his depictions of the horses and carriages — the elegance of a high stepping thoroughbred, or the terror of the horses caught in a snowdrift — it’s all there in Thomson’s work. I’d bought the book thinking to learn a little more about the history of coaching, what I found in fact was a treasure trove of drawings from one of my favourite artists. It just goes to show that sometimes things turn out better than expected.